A permanent pacemaker is usually implanted in a patient when the heart beats too slowly. The medical term for this is “bradycardia”. Bradycardia can cause symptoms such as dizziness, fatigue, or fainting spells. Rarely, pacemakers are used to treat other kinds of heart problems. A pacemaker is made up of the generator (battery) and lead(s) (“wires”). The generator contains the battery and computer circuits. A pacemaker lead may be placed in the upper or lower chamber of your heart or in both places. The tip of the lead is placed against the inside wall of your heart and the other end connected to the generator. This allows the generator to send small electrical impulses to the heart. 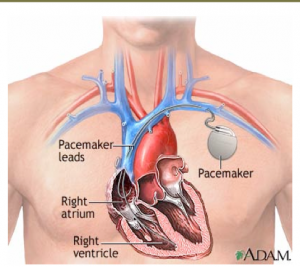 The pacemaker implant procedure is performed at the hospital. In preparation for the operation, you will be given basic instructions by hospital staff. You will be asked not to eat or drink anything on the morning of the operation. Someone else should drive you to the hospital and take you home afterwards. If you are taking medications, it is usual practice to omit the pills the morning of the operation. After you arrive at the hospital, everything will be checked in preparation for the operation. The use of conscious sedation or general anesthesia will be decided on a case-by-case basis. You will be given antibiotics prior to the procedure. Local anesthetic (similar to “dental freezing”) will be injected into the skin typically under the left collar bone. A small incision will be made in this area and the pacemaker wire will be inserted into the vein, and advanced into the heart chamber. The wire/s are moved to the right position under x-ray guidance and secured in place. The wire/s are connected to a generator. Testing is performed to ensure satisfactory function of the pacemaker. The wound is then closed. A transparent water-proof dressing and a pressure dressing are applied over the wound. You will monitored on the ward overnight and antibiotics will be given. A chest x-ray will be routinely performed to document the position of the leads and to exclude any injury to the lung. You will be discharged the next morning if all the checks are satisfactory. You will be given oral antibiotics for 1-2 weeks. You should not drive for at least 2 weeks, and avoid lifting the arm on the same side as the device above shoulder height for 6 weeks. You should leave the pressure dressing for 2 days. After that you can shower with the transparent dressing. The transparent dressing can be removed by your GP after 7 days. There are usually no stitched to remove. It is common to experience a mild ache over the area for 2-3 weeks and over-the counter pain killers may be required. It is also usual to notice some bruising over the site which will move down your left arm and chest. This should resolve after a few weeks. Q. How often does it need to be checked? A. After 3-4 week. Then at 3 months. Then annually. Q. 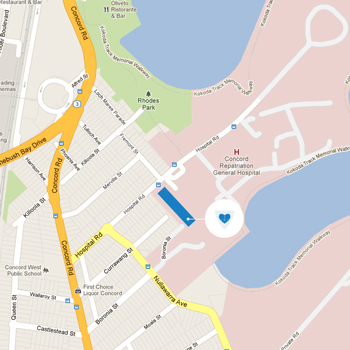 Will the pacemaker stop my heart from going fast? A. No. The pacemaker is designed to pace your heart when your own rhythm goes too slow. You may require additional medications or an ablation to treat the heart racing condition. Q. I am on blood thinners. Does that matter? A. Yes. Please let us know! Dr Sy will advise management of your blood thinners around the time of your procedure.